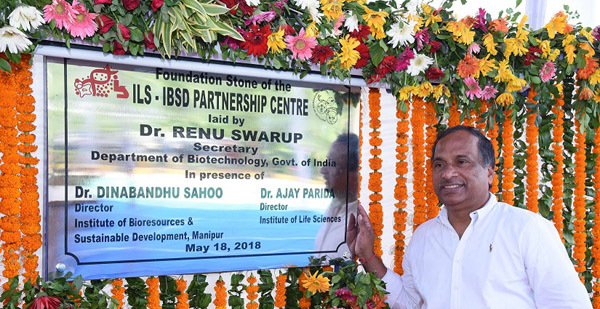 The foundation stone for a research partnership between Institute of Bioresources and Sustainable Development (IBSD), Manipur and Institute of Life Sciences (ILS), Bhubaneswar was laid on Friday. The research partnership will focus on conservation, value addition and sustainable use of rich bio-resources of Odisha and the North East region of the country, according to IBSD sources. The partnership between the two institutions of the Department of Biotechnology – ILS and IBSD, will look for collaborations with other national and local institutions and universities to undertake need-based research activities and contribute to a great extent for meeting societal goals, says Secretary Dr Renu Swarup of Department of Biotechnology, Government of India while laying the foundation stone. Capacity building of scientific personnel of North-East region in the area of advanced biotechnology research and development will be one of the major focuses of the centre, she said. In his address, Director Professor Dinbandhu Sahoo of IBSD said North East region of India falls amongst the top 10 Biodiversity hotspots in the world. All the eight NE statesare rich in Biodiversity and many are unique. There are several unexplored areas which can unravel new species and new knowledge. The bioresources need value addition through application of modern technology. This centre will act as a Biotech hub and provide much needed hand holding for training the people. Not only the people from IBSD can take the benefit of this centre but also from other Institutes will be highly benefited, Sahoo added. Director Dr. Ajay Parida of ILS mentioned that since the signing of Memorandum of Understanding last year, five major collaborative research progammes are being implemented and a number of students and scientist exchange visits has been organized and hoped that this centre will undertake research on priority areas of relevance to both the region. Principal Secretary Nikunja Dhal of Science and Technology, Government of Odisha; Financial Advisor B. Anand of DBT; Advisor Dr.Meenakshi Munshi of DBT and Nodal Officer ,ILS, Dr Soumendra Patnaik, Vice Chancellor Utkal University, Sanghamitra Pati, Director, RMRC and others attended the foundation laying event of the centre.